The world of Olympic basketball was irrevocably changed in 1992 when the “Dream Team” broke the age-old amateur rule and fielded an unstoppable aggregation of NBA stars. But before that Dream Team, there was an earlier squad of American players who captured the Gold while upholding the Olympic amateur ideal. Competing at the 1960 Summer Games in Rome, Team USA featured America’s finest collegiate stars including four future Hall of Famers: Walt Bellamy, Jerry West, Jerry Lucas and Oscar Robertson. Coached by Cal-Berkeley’s Pete Newell, the American team won every game of the competition by an average of 42 points to win the Gold. The squad’s collective talent was such that the entire team has been enshrined in the Naismith Basketball Hall of Fame, and is regarded as the greatest amateur basketball team ever assembled. 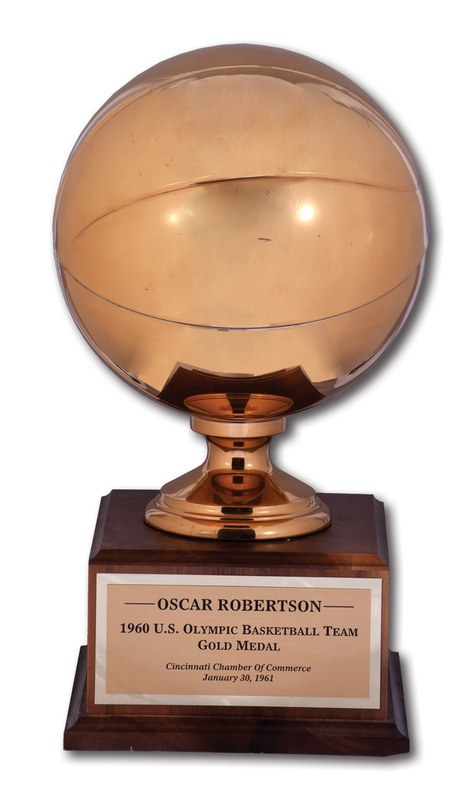 The undisputed star was 21-year-old Oscar Robertson, who had just finished off perhaps the most dominant college career ever at the University of Cincinnati. As the point guard, floor general and co-captain, Oscar led the Olympic squad in scoring at 17 points per game. 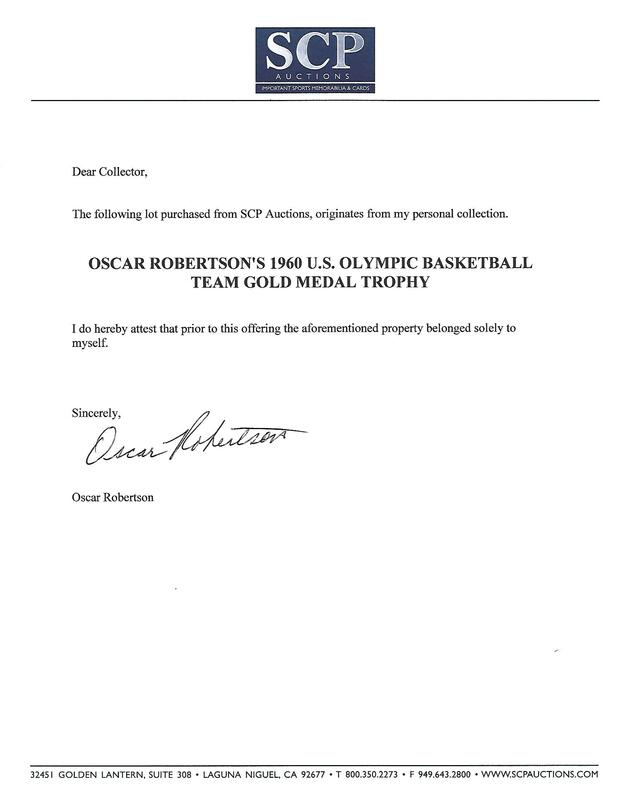 To recognize this monumental achievement back home, the Cincinnati Chamber of Commerce presented Oscar with this "1960 U.S. OLYMPIC BASKETBALL TEAM GOLD MEDAL" trophy, as the Jan. 30, 1961 dated placard reads. 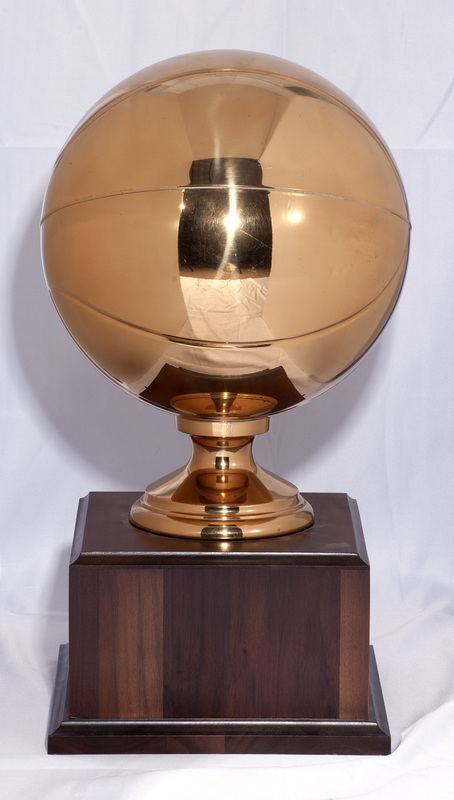 The piece stands 17" tall on a 8.5" x 8.5" wooden base, with a life-sized gold washed metallic basketball on top. The trophy weighs around 5 lbs. and presents in outstanding condition with no blemishes to speak of. A great award from The Big O's personal collection to put on your own mantle. Includes LOA from Oscar Robertson.